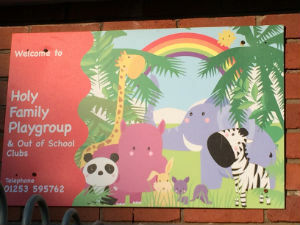 Holy Family Playgroup is part of the parish of Holy Family offering quality, affordable childcare and education for children aged 2 – 12 to families in the local community. We are Ofsted registered with qualified and experienced staff. Playgroup offers full day care from 9am to 5pm and sessional 9am to 12 noon or afternoons 12.30pm to 3.30pm, other sessions by agreement. Grant funding for 15 hours per week is available to 3 and 4 year old children; term time, 38 weeks per year. The cost for hours over the grant will be £2.85 per hour. We also have a holiday club that can be booked and paid for as needed in the school holidays. Fees are paid monthly and childcare tax credits and childcare vouchers can be used. Now has spaces available for September 2016. If your child is over 2 years old or nearly 2 and you would like them to attend playgroup, please phone 01253 595762 or come and see them at the church hall about the provision they can offer. Breakfast Club We are open each school morning from 7.45 am with a choice of menu-hot and cold. Children are escorted to school at 8.50 am and a walkround is also available. The cost is £2.40 per day with breakfast, walk rounds are £1.20. After School Club Children are picked up from school at 3.15 pm. We have a wide range of indoor and outdoor activities available until 5.30pm. Children can have a drink and snack - these vary from cereal and sandwiches to pasta and pizzas. The cost is £4.75 per day with a reduction for a second child and a full week. These are paid monthly in arrears. Holiday Club Open each holiday except Christmas. Offering full day care from 9am to 5pm. We have a wide range of activities available – hall based or trips out. A full list will be sent out when you register. The cost is £16.50 per day, with extra for trips, reductions for a second child in the family and/or a full week. Registration in line with Ofsted is required for every child. If you would like to know more or would like a registration form call in at the church hall any week-day or phone 01253 595762 and ask for Ellen or Julia. Fully Trained, qualified and DBS cleared Staff. OFSTED Registered with a ‘Good’ rating. Full or part time sessions available. Open daily from 8:30am – 5:30pm. On Links Road, North Shore.